My family loves chicken and chicken casseroles. That's good, because a little chicken can feed a lot of people when you use it in a casserole. One of our favorite dishes is my Quick and Easy Chicken Alfredo recipe. I have taken this to covered dish dinners, and I seldom have any to bring home. While noodles cook, open and drain chicken. Break the chicken up into small pieces. 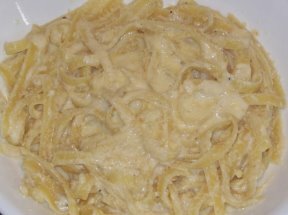 In a large bowl, mix alfredo sauce, parmesan cheese, garlic and onion. Mix well, then add chicken. Heat until simmering. Stir chicken mixture into noodles, and pour into a 9"X13" baking dish. Sprinkle mozzarella cheese on top, and bake at 350 degrees F for 20 minutes or until the cheese on top melts. I usually leave out the onions if I am taking the dish to a covered dish dinner, since many people do not like onion. However, when I make this for my family, I usually add the onion. I realize that this is a shortcut chicken alfredo recipe, since I don't make any of the ingredients myself. Some people have a problem with that. However, after a long day at work, a quick meal like this is perfect to allow for more family time. I prefer family time to working in the kitchen time.